Nokia Asha 303 is the best phone for today, since the mobile prices and the usage costs are increasing like anything, Nokia has brought an ultimate solution for this. 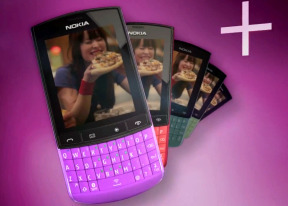 With the new Nokia Asha 303 i can anything free of cost with all my contact lists. i can chat with them i can send and receive audio, video or official files across and i am online every second of my life, yes iam talking about the whatsapp inbuilt feature in Asha 303. I am really impressed with this free feature and also i don't need any smartphone in my whole life, as Nokia Asha 303 has everything. i want to set on its autorate,please hint me. wats the use of 1 GHz processor if we can't multitask ???? No VOIP supported by this os... Then wats the use of 3g and wifi ???? Does the phone work with youtube? does this phone have an option for minimizing tabs coz what's the need for multiple tabs when you cant really minimise to multitask..
Why does the phone connects to package data for web browsing when we are already connected to wifi. Reply please. Any solution for this? there is a msg option cuming at the top of the screen how can i get rid of that option, i know that there is an option of msg when our inbox gets full but my inbox is empty and i m sill having this msg option .. !! AnonD-38430, 25 Apr 2012I am not getting that why this phone have 1ghz processor & 128 MB RAM? Does this phone hav... moreActualy, I have not any problem with 1-2ghz cpu n 128-512mb RAM in s40 phones, i asked that bcoz i want to know whether this phone have minimizing apps/ multitasking feature or not, bcoz for minimizing apps/ multitasking feature you need these type of cpu n ram capacity..
i am not getting that why nokia still have not implemented apps minimizing feature in their s40 phones? Just look at sony ericsson Java phones, from many years, they all have apps minimizing feature & a very huge java heap size..
Nokia also produces phones based on the "Series 40" platform but this is based on the proprietary Nokia OS. This platform is less flexible and powerful when compared with S60 and therefore is being used on cheap and mid- range devices only. Symbian is the most popular Operating System for mobile gadets. It is developed by Symbian -the company- which is found and owned by Nokia, Motorola, Ericsson and some other wireless companies. 1. Even when im connected to the wifi, my phone uses packet data for browsing internet. Why is that so? 2. Secondly,when iam connected with packet data, after its use i am unable to disconnect it from the phone. I have to switch off my cell for that. Please tell me how to disconnect packet data after use? 3. Lastly, the battery loses its one bar few hours after being fully charged, i do not listen songs, i do not make long duration calls. Then why its battery is not working efficiently? Jejemon, 25 Apr 2012Which is the best among all the asha series? letter s in S40 means?